Battle for Gilneas has been one of my favorite BGs for a while now. I like how simple it is, there are no real gimmicks, and there are no long runs where you don't run into any of the opposing team. Unfortunately, sometimes that can mean it gets a bit boring, especially if your opponent caps Water Works before you, they can "turtle" (sort of) for the rest of the fight, not killing any of you, just AoEing, healing and respawning. Our RBG team starts off probably the same way many RBG teams do, that is, sending a couple to lighthouse, one to the overlook, and everyone else to WW. As a hunter, I am on overlook duty, though anyone who is comfortable 1v1ing and 1v2ing will do fine up there. It is quite helpful to have a hunter in this role, though, in case you're opponent is trying the 8&2 "invisible" strat, they'll have to get by my flare and enhanced stealth detection. 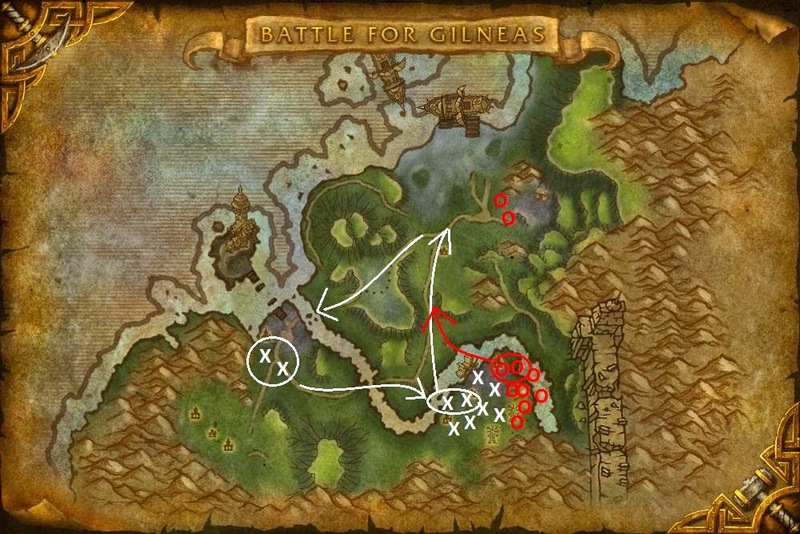 The vast majority of the time our opponent will leave one or two at their starting area, and send everyone else to WW; when that happens, I'll jump down the cliff and help out there. On the rare chance that someone goes up to my overlook, if it's one or two dps (and they don't run away at the sight of my magnificent hunteritude) then I'll engage there and off them. If they've got a healer with them, or it's a larger group, I'll disengage back to the light house so the three of us can take them down. Most of the time I end up at WW, though. This is of course not anything special, it's just a way to start the fight. At higher ratings you get more teams who will leave one at LH and send 9 to WW, which works similarly. Where the counter trey would come in, is if we allowed them to cap WWs, and they went into a sort of holding pattern. At this point, we can attempt to ninja cap WW. Or we can just sit there and hope to beat them in a straight up brawl. Generally healers are so much more powerful than Damage Dealers in PvP that they'll have the cap for too long while you're trying to brawl with them (this is why they don't have 10v10 arenas). Another thing that sort of sets this up, is generally the two or three at LH don't have anything to do, they're just twiddling their thumbs. So sometimes they'll go harass the opponents at mines. What's fun here, is that now your opponent knows that the two from lighthouse are ready to go to mines any time. So if you can take just two people from WW and start heading to Mines, they'll most likely assume they'll be facing 2v4 at mines. This, is when Delirium's Battle for Gilneas Counter Trey© happens. In case that's not clear, the play is: two players peel from WWs and head for Mines. If two or more opponents follow, then you're in a great position, because at the same time your two players from the lighthouse have snuck over to WW, leaving you with 8v6 at WWs. The "faking" players can choose whether to engage at Mines to really put some pressure on them, or, the safe, and better option, to head across the Overlook to go protect the LH. The best part is, if the fake-out completely fails and no opponents follow, you're not any worse off than you were before, you've got two players at LH, and everyone else 8v8ing at WW. So no harm done. But if it does work, you've got two players 2v2ing at LH, and everyone else 8v6ing at WW, while two of them twiddle their thumbs at the mines. If you're really in a bind, you could augment the play a bit, but upping the number players on the fake-out team. If you send four people from WWs to act like they're going to mines, and you get four opponents follow, they'll you'll be 6v4 at WW, which is a bit easier position to be in. If no one follows, you of course have the option to push mines, where you'll be 4v2. Though of course your risk goes up in that if no one follows, you'll be 4v8 until the LH crew gets there, and likely won't be able to recover by the time your fake-out team gets back, since some of your players will surely be dead.